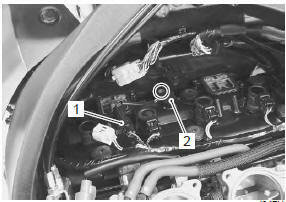 Disconnect the coupler (1) and remove the cmp sensor (2). Install the cmp sensor in the reverse order of removal. when installing the cmp sensor, make sure to clean the sensor surface. 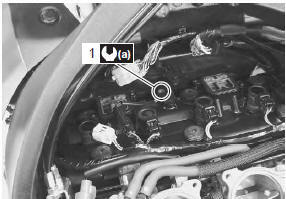 Tighten the cmp sensor bolt (1) to the specified torque. Refer to “ckp sensor inspection” in section 1h .